Our multidisciplinary approach ensures the best patient outcomes while reducing treatment time and stress on patients. 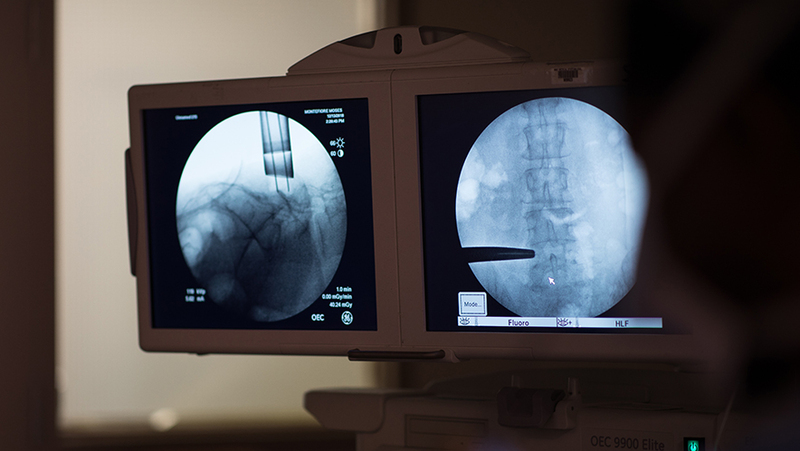 We take a multidisciplinary, holistic approach to treat the full range of degenerative, traumatic, oncologic, vascular and congenital conditions of the spine. We treat the entire patient, listening to his or her concerns and consulting across a variety of disciplines to find the appropriate decompression surgery and/or spine reconstruction path that meets his or her needs. With an all-in-one location, we deliver more than patient convenience. Our center allows patients to be evaluated by a close-knit group of specialists in neurosurgery, orthopedic surgery, rehabilitation medicine and pain management to ensure the creation of the optimal and least invasive treatment plan. Your Montefiore Comprehensive Spine Center team is committed to working together to realize the best patient outcomes. 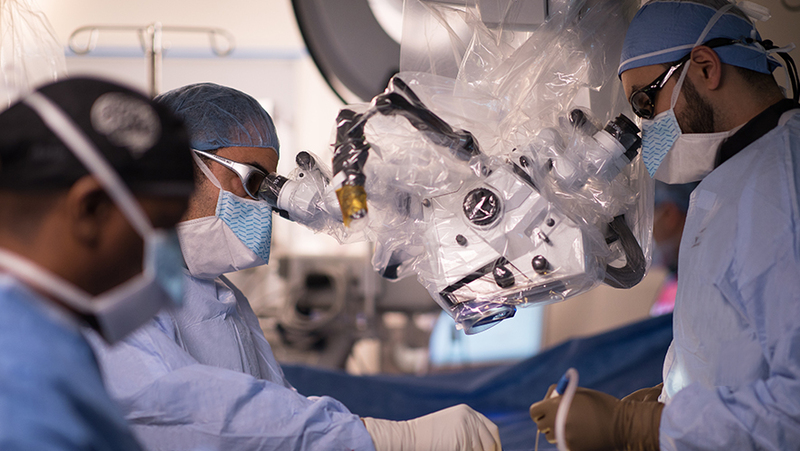 Reza Yassari, MD, uses a microscope to perform a minimally invasive spine surgery. We encourage each surgeon in our program to have an area of specific specialization, focus and interest within the discipline of spinal surgery, often referred to as subspecialization. This expertise spans nerve and spinal cord compression syndromes, peripheral nerve entrapment, intradural spine and nerve sheath tumors, tumors affecting the spinal column and scoliotic deformities of the spine. Intraoperative imaging is used to ensure the correct level and to minimize the incision during surgery. We have brought together a multidisciplinary team driven to advance the health outcomes and options available to our patients. Our multidisciplinary Spine Center team treats a vast spectrum of conditions, a selection of which you will find listed below. In addition to these, we have experience in treating many other conditions. Please contact us today to schedule a consultation so that we can review and discuss your specific healthcare needs. 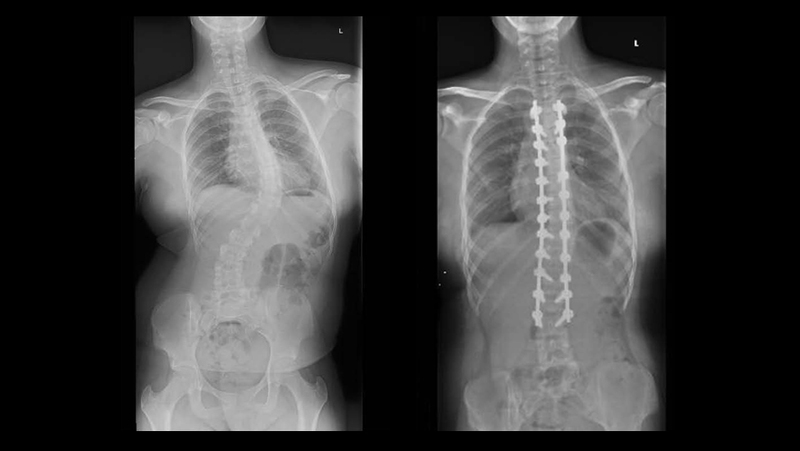 Left: An X-ray shows a patient with severe spinal scoliosis (curvature). Right: An X-ray of the same patient following corrective surgery shows the spine straightened. Treatment plans are designed to maximize our patients’ care, returning them to health as quickly as possible. For those seeking further information, we have included a few examples of the surgical and nonsurgical treatments we offer at the Montefiore Comprehensive Spine Center.